The heaviest rainfall since 1989 has hit Spain's southern coastline and flooded the streets of the city of Malaga and nearby towns. Floods have killed one woman and prompted the Spanish government to issue a public safety warning. A 26-year-old-woman was found dead in a shopping centre the town of Estepona on Spain's Costa del Sol, a spokeswoman for Malaga's local government said. It is believed she drowned. A post-mortem examination will be carried out in the next few hours. Spain's meteorological service on Sunday issued a 'red alert', its highest level of warning for 'extreme risk', although it since lowered the warning one level to 'important risk'. 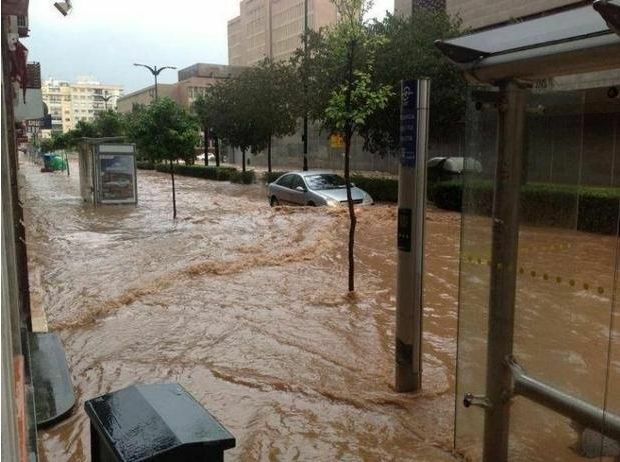 TV footage showed rainwater cascading down streets in towns such as Estepona, reaching as high as the tops of cars. The local government said more than 600 emergency incidents had been reported due to weather and 300 rescue workers were working on Sunday to help people. According to Olive Press, the police in the area have said it is the worst rainfall since 1989. It also reports that the amount equivalent to a month's fall hit over the weekend. The Spanish Metrological Office (AEMET) reported they were expecting 100 cubic metres to fall between 8pm Saturday and midnight tonight. On the roads several cars have been abandoned and there is heavy flooding in several stretches, including the tunnel in Sabanillas. The rains have also washed rocks onto the roads. The rain is set to continue throughout the day until Monday, when the Orange Alert will be downgraded to Yellow. The city of Malaga and surrounding towns, including the upscale resort town of Marbella, are among the most heavily hit areas. Malaga has a population of around 500,000 residents.